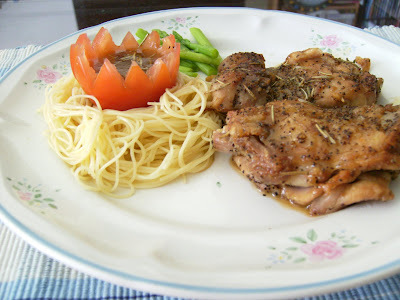 My simple arrangement of pan grilled rosemary chicken chop. 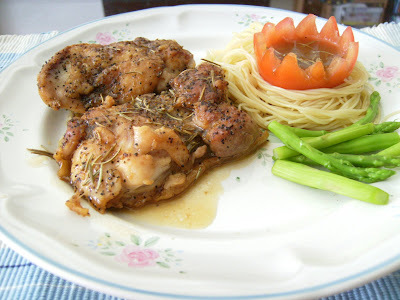 This chicken chop is actually seasoned with salt, black pepper and rosemary. 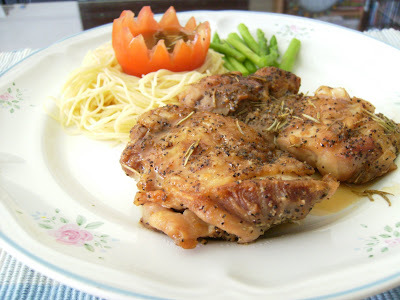 Subsequently you just need to pan grill it in a non-stick pan without any additional oil as the chicken skin would produce enough oil for the whole process of grilling. Top it off with a gravy make from a mixture of light soya sauce, honey, lemon juice and water. I blanched some aparagus and cooked some angel hair spaghetti to go along with it. With this, it's a complete meal again. Actually life can be very simple if you don't asked for too much. Wow, It's look good. Made me hungry! If you pre-season your boneless chicken thigh, you can have this any time you want.